Anonymous said… Hard to communicate with, doesn't like to be social, doesn't like change,never compliments me. He shows his love by actions and not words but has changed a lot since we were married 35 yrs ago. 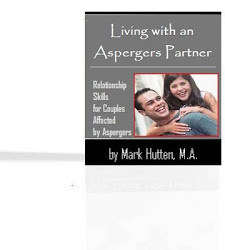 Our son has Aspergers and I have learned through his therapy and progress that my husband is on the spectrum. He thinks I can read his mind because it seems so painful for him to communicate. Very passive-aggressive. Anonymous said… his "special interest" is a lifelong addiction that he wont recognize as such but also wont spend time doing anything else to the exclusion of helping around the house or interacting with his children. He will go to work but as soon as he gets home he shuts down, and focuses on his interest. If I ask him to do anything that doesn't involve his "special interest" he gets very irritable and tries to sabotage whatever else is going on a) his way of trying to manipulate so that he isn't called on again, b) so he can get back to his addiction. Anonymous said… I didn't know. They didn't know. I got close to a diagnosis of myself with two books. NOBODY NOWHERE and SOMEBODY SOMEWHERE but got side swiped by movie Mr Jones. I was more like that. I still dont know about myself. The psychiatrist says you cant find out at 65 .... I differ but I dont care anymore. I take the drugs and try not to die of light and noise and travelling and boxes and suitcases and loneliness. My marriage ended. My child tried so hard to be normal I thought she was fine. Now I am just sad because I didnt know. My child figured it out watching Parenthood. She's in therapy and doing well. I think. Anonymous said… I love social events but it is like Chinese water torture to him. Anonymous said… Lack of connection. Anonymous said… Lack of empathy, lack of affection , lack of communication, lack of support through very difficult times. Always always always feeling lonely in my marriage. Anonymous said… Missing the physical and articulate expressions of simple affection and of passionate curiosity of ones object of desire. It is like reading music when you know what the orchestra sounds like and seeing the branches move without the sound of the breeze. Anonymous said… Poor communication, defensiveness, rigid thinking and lack of empathy. Anonymous said… Socializing with others as a couple. He often offends others because they don't know him. Anonymous said… Aspie....Altered reality. Them not being responsible, affectionate, honest, paying bills on time, or fully understanding the consequences of their actions etc. Anonymous said… Coping with the constant and repetitive verbal stimming. Anonymous said… Everything is a challenge! It's like walking on eggshells. What is the helpful solution? Anonymous said… Lack of emotional support during crisis. Inability to solve problems. Anonymous said… My greatest challenge was understanding that my paradigm of what our future looked like could not exist. I had to modify my desires to meet with his abilities. It has caused amazing growth in him and our marriage. No it doesn't look like anyone else's, but it sure works for us! Anonymous said… my hubby is honest but everything else is spot on.